You will probably like this game if you like puzzles and search games. 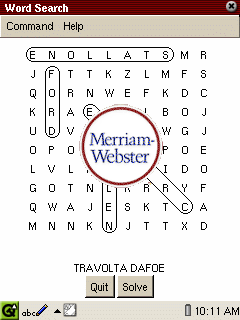 Merriam-Webster Word Search is the word search game you know from many puzzle magazines and newspapers. You have to find and connect words hidden in a field of random letters. The words can appear in any direction either backwards or forwards. The set of words can be chosen from a list of nearly 30 categories. The game profits from its pen and paper puzzle origin. If you are interested in these puzzles you probably look forward to an implementation of them on a mobile device. The implementation of the game is very straightforward. And this is already the main good and bad point about it. On the positive side is that that game runs smoothly and you have no problems playing it. The many categories seem to offer a lot of choice for playing. Furthermore, the game board is presented clearly and the finding and marking of the words is easy. Variable board sizes, different word number, more words, levels and a decent highscore system might have made this game very interesting. So overall, the game is a bit simple. However, if you love word search puzzles and have a lot of long train or plane journeys you might want to have a look at it.